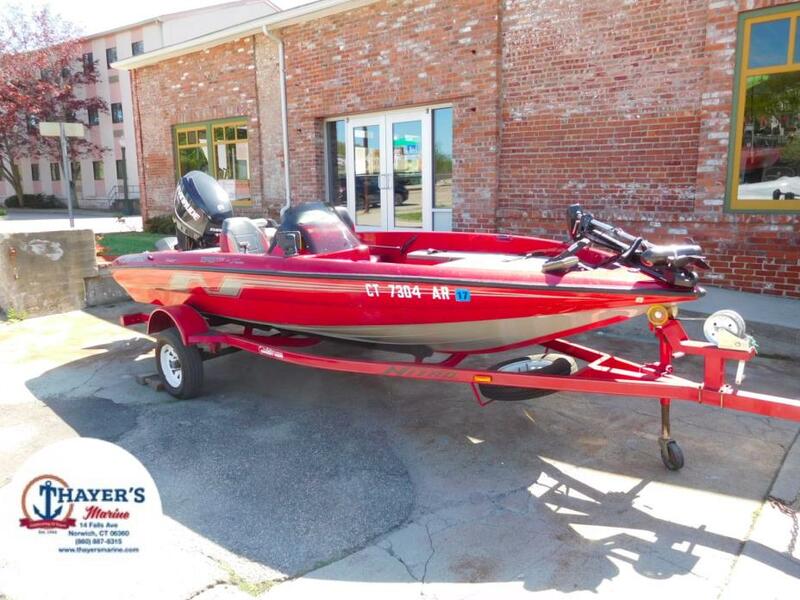 1995 Nitro 170 TF, 1995 Nitro 170 TF - BUJ08709D5952014 Evinrude 115HP Etec - 53779611995 Tracker 17TRLR - 4TM13AE15SB002867ENGINE WARRANTY UNTIL 2019 !!!!!!!!!! !PLEASE ASK ABOUT THE AVAILABILITY OF ZERO MONEY DOWN FINANCING!!!!! 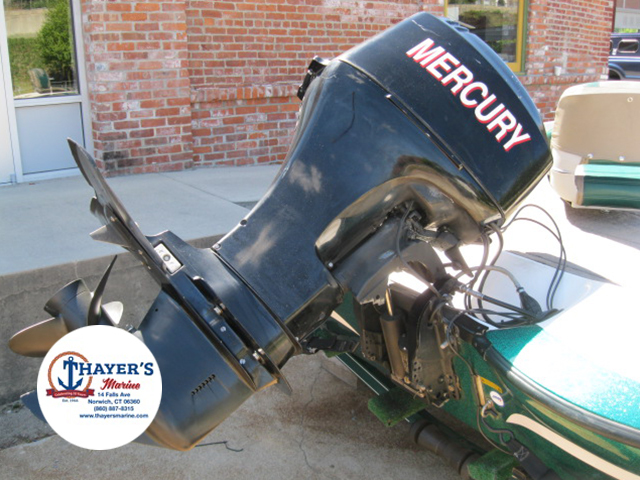 !INCLUDED OPTIONS IN THIS BOAT:- Motorguide Pro 60 56# Thrust Trolling Motor- Humminbird Fishfinder @ Dash- Humminbird Fishfinder @ Bow- 3 Blade Stainless Steel Propeller- Spare Tire for Trailer- Keel GuardThree generations of boating know-how make Thayer's Marine, Inc. your leader for everything boating. With over 100 years of boating experience, we have learned what works, what doesn't, and pioneered what will. Our sales department works to find you the boat of your dreams, our parts department helps get you back on the water, and our service department fixes those problems you cannot, the first time. Oh, and CSI scores in the upper 95 percentile to back it all up. 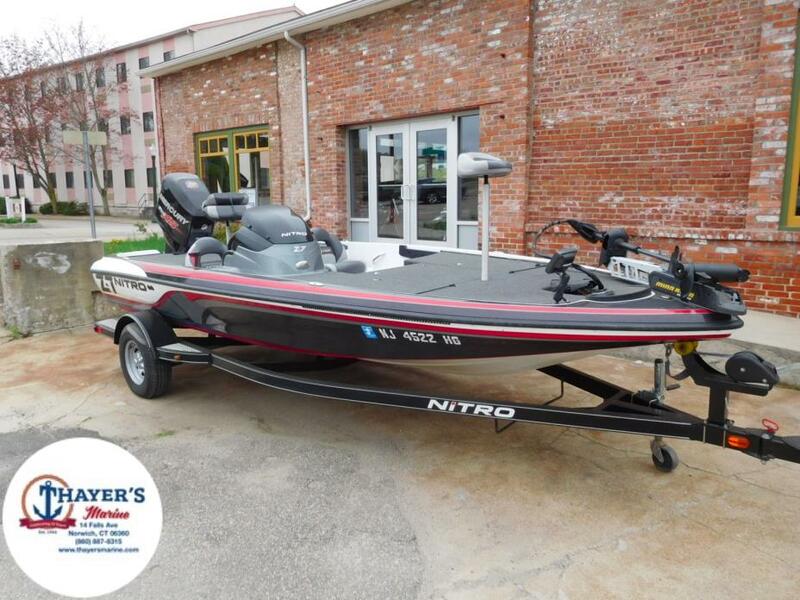 2014 Nitro Z7, 2014 Nitro Z7 - BUJ34134H3142014 Mercury 150 Pro XS - 2B0133372014 Nitro Trailer - 4TM14HF19EB001276PLEASE ASK US ABOUT THE AVAILABILITY OF ZERO MONEY DOWN FINANCING!! !ENGINE WARRANTY THROUGH MERCURY UNTIL 9/2/17!!!!! !INCLUDED OPTIONS IN THIS BOAT:- Hydraulic Tilt Steering- 3 Blade Mercury Tempest Plus 25P Stainless Steel Propeller- Two Minn Kota Talon BRACKETS ONLY!- Transom Saver- Minn Kota 80# Fortrex US2 24V 45' Trolling Motor- Lowrance Mark 5X Fish Finder @ Bow on Ram Mount- Keel Guard- Blue LED Boat Lights EVERYWHERE!- Guest Charge Pro Battery ChargerThree generations of boating know-how make Thayer's Marine, Inc. your leader for everything boating. With over 100 years of boating experience, we have learned what works, what doesn't, and pioneered what will. Our sales department works to find you the boat of your dreams, our parts department helps get you back on the water, and our service department fixes those problems you cannot, the first time. Oh, and CSI scores in the upper 95 percentile to back it all up. 2004 Nitro 640 LX, 2004 Nitro 640LX - BUJ19423K3042002 60ELPT 4S - 0T2960882004 Nitro Bunk Trailer - 4TM14MD134B001106- Included Options - - Minn Kota Power Drive 50lb, 12 v (Bow)- Painted Nitro Trailer (Green)- Tie Down Straps- Canvas Cover (Blue)- Specifications - - Hull Material: Fiberglass- Beam: 7'0'- Length: 16'- Net Weight (lbs): 1092 Three generations of boating know-how make Thayer's Marine, Inc. your leader for everything boating. With over 100 years of boating experience, we have learned what works, what doesn't, and pioneered what will. Our sales department works to find you the boat of your dreams, our parts department helps get you back on the water, and our service department fixes those problems you cannot, the first time. Oh, and CSI scores in the upper 95 percentile to back it all up. 2003 Nitro 901 CDX The Nitro 901 CDX is rigged with standard features usually found on options lists: a rod organizer, compartment lights, power pedestals, a jackplate, a loose item tray, a tackle management system, mag wheels, a trailer with fiberglass fenders and swing-away tongue, and much more. The 901 CDX was also engineered with the dedicated fisherman in mind. The front deck drops off into a deeper, split-level floor so anglers can easily lip and land fish. 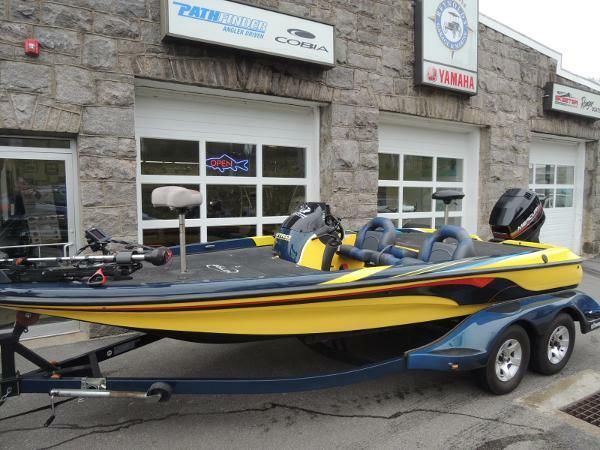 Everything about this boat makes it one of the best tournament boats on the water. This boat is equipped with Lowrance HDS-8 and HDS-7 with structure scan, Motorguide trolling motor, on board charger ready to fish.